One way to connect an RFM12B to a Raspberry Pi is to simply plug in a JeeLink, using the built-in USB capabilities of the RPi. But that’s a bit of a detour – why go through USB? Since the JeeNode’s FTDI connector can use 5V power and has TX/RX pins at 3.3V logic level, it’s actually a perfect match for directly connecting to a Raspberry Pi. Let’s do it. I’ll be using the command shell on the RPi, using a network SSH connection, but this could also be done from the console with a keyboard, of course. Now logout and log back in to make these changes take effect. > Note: not all RPi Linux distro’s are set up in the same way. If ttyAMA0’s group is “dialout” instead of “tty”, chances are that you’re already a member (type “id” to find out). In that case, skip the above usermod command. change this line: T0:23:respawn:/sbin/getty -L ttyAMA0 115200 vt100 to #T0:23:respawn:/sbin/getty -L ttyAMA0 115200 vt100. I.e. comment it out, and save these changes. And that’s it. There is no longer a process trying to respond to our serial port. > Note: again, this may not be needed if you don’t see “ttyAMA0” listed in the ps output. You also have to make sure that the kernel doesn’t log its console output to this serial port. Look in the file “/boot/cmdline.txt” and remove the text console=ttyAMA0,115200 kgdboc=ttyAMA0,115200 if present. Then reboot. Connect a single jumper as indicated (a little jumper block would also work), connecting RXD with TXD. This means that everything sent out serially will be sent back and received serially as well. A very convenient test that we’ve got all the Linux stuff set up properly. You should see a blank screen, and whatever you type in should show up on the screen. If this is indeed the case, then there is data going out and back into the serial port. To really make sure, disconnect the jumper and the echoing will stop. Excellent. Almost there. Screen is a very convenient utility, but you need to remember how to get back out of it. The key sequence is CTRL+A followed by “\” (the backslash key). Update – additional contributed notes. @JCW, are you considering moving to the PI as your collection platform? If so, what software are you using to to collect the monitoring data? No change of plans, really. I’ve always intended for some Linux board to become the central home monitor / controller, and decided a few months back to base the infrastructure on ZeroMQ. That means there’s no platform-dependence so far. Been exploring a couple of storage options, from plain replayable-logfile format, to my own Metakit database, to a simple set of round-robin data files I implemented earlier this year. Even the choice of storage engine is really not too important when the main infrastructure is based on “plumbing” and “protocol”, with messaging and RPC as glue mechanism. But to get back to your question: the RPi is not necessarily the best fit for a server – it’s half the speed of a Sheevaplug, has half the RAM, and its video may not be needed. Then again, its price is excellent. I remember that this was one of the first things I did when I got my rPi. I also added a wire from a GPIO to function as a DTR line. With a little bash script I could upload new code to the node too! Hey, could you show me your code? I’m having trouble getting the reset to work together with avrdude. Timing problems, I think. Excuse me, I meant pyhton because bash was to slow. 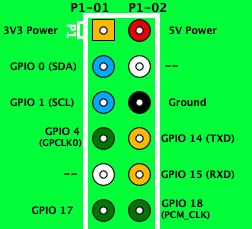 This may help you: https://projects.drogon.net/raspberry-pi/gertboard/arduino-ide-installation-isp/ Since the Gertboard will have an Atmega on it, the above link describes how to modify the Arduino environment to program the Gertboard using the Raspberry Pi. Thank you – very nice info, but that’s for SPI-programming, whereas I’m currently looking for a way to use the uploader over serial. I can toggle a GPIO and cause a reset, but it’s done before starting the (unmodified) avrdude, and that seems to cause too much delay. Another possibly relevant point about choice of platform for logging data is the video out. There’s only a practical (as opposed to hobbiest) point in having all this environmental data if the home user is aware of it – and hopefully acts on it. A £60 small HDMI monitor in the hallway (or fed to the family TV) with the data visualised in a funky way could make all the difference, for no extra money spent! I basically used the approach you used in the nest post, and was running as root. I also didn’t write any code since it was on the python shell. I used adafruit’s GPIO python module to toggle a pin and directly after that I called a python subprocess.call([“avrdude”,”args”]). This worked about 1 in 4 times, so there are still lots of timing issues and it was just an experiment for me. Stay tuned for the next post, I think I’ve figured it out. Works perfect here! I attached my RF12 receiving JeeNode to the RasPi and just had to change my perl program to read the data from a different device. Now I will think about showing the information on the TV instead of only sending it to cosm.com for visualisation! @jcw: thanks for your work!